Here's the pinout for the Space Harrier 50 pin connector. So the inputs for Space Harrier are very straightforward, there are two axes for direction and three shot buttons, as well as the usual coin, start and test and service inputs. In testing I actually found that the "Shot 1" and "Shot 3" buttons are reversed, though it doesn't really matter. I bought myself an old analogue PC joystick and set about rewiring it for both Space Harrier and Hang-On. In the case of Hang-On I still use my Out Run pedals for the accelerator and brake, so only the left/right axis of the joystick is needed. Another decision I made was to not cut the 15-pin joystick connector off, and I also didn't want to connect directly to the Space Harrier board, so instead I soldered all of my connecting wires to another 15-pin connector for the joystick end and a big Molex plug at the other end. The wiring inside a PC joystick is a little different to what the Sega games expect. 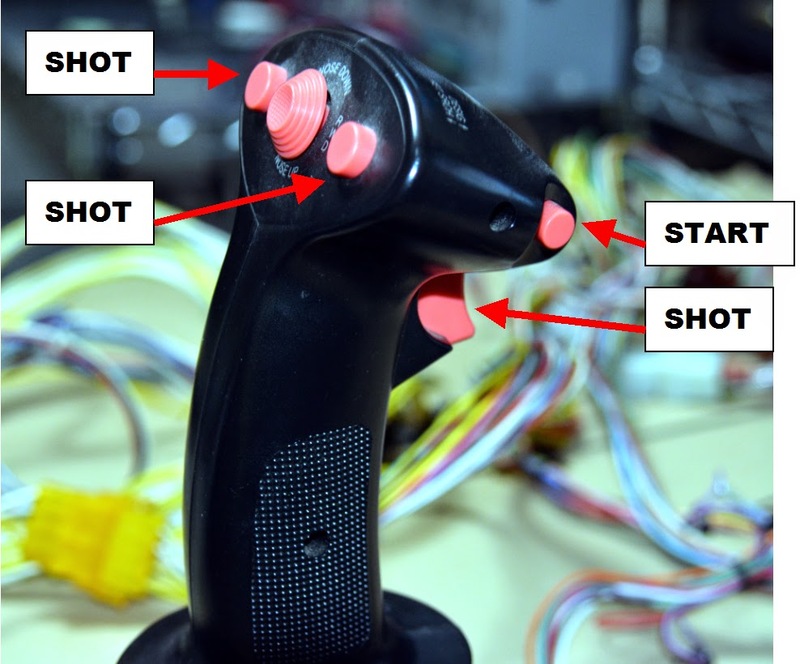 Also, if you have an old joystick or buy one it may have extra electronics on the inside for autofire etc. It was easy to connect the fire buttons on the joystick though the axes were more complicated. Looking at the pinout above you can see that there's only one +5V line and one Ground line, so you'll need to connect each of them to both pots. The joystick I have works perfectly, with full range in each direction. I didn't want to cut any wires I didn't need to on the harness, so I use the Service button on both games for credits. The start button is mapped to the fourth button on the joystick. This is very cool! I was just playing the sitdown Hang-On and Space Harrier at Funspot on last Monday. I have a Super Hang-On upright and I want to run regular Hang-On in it too. Thanks for the comment. Hang-On uses a completely different wiring harness to Super Hang-On, though with a bit of work you could probably get it to work ok. I'm just rigging up a Sppce Harrier myself this page has been a great help in getting me set up but one thing i'm not sure of is how to wire the pots up, the pots on the back are labelled 1-2-3 so where where does the +5, GND and AXIS connections go? The axis connection should be the middle one on the pot, and then one of the other two is GND and the other +5V. The easiest thing is to try them out, connect one end to +5V and the other to ground and see if it's working ok. If not, for instance if pushing left moves you to the right, simply switch the two wires around. That makes much more sense now I have an actual Space Harrier joystick I'm wiring up and the 5v to control the input was the bit that was worrying me so thought I better check before wiring up just in case. Thanks for the info. and keep up the good work MK!